Prebiotic Dietary Vegetable Fiber, Milk Protein Isolate, Whey Protein Isolate, Chocolate Cookie (Calcium Caseinate, Chicory Root Fiber, Palm Oil, Sugar, Alkalized Cocoa Powder, Ground Flax Seed, Sunflower Lecithin And Natural Flavor), Almond, Chocolate Chunks (Unsweetened Chocolate, Cocoa Butter, Soy Lecithin [emulsifier], Vanilla), Xylitol, Glycerin, Organic Chocolate Coating (Unsweetened Chocolate, Cane Sugar, Cocoa Butter), Cocoa Powder, Natural Flavors, Palm Oil, Sunflower Lecithin, Sea Salt, Cashew, Sunflower Butter, Peanut, Stevia. Prebiotic Dietary Vegetable Fiber, Whey Protein Isolate, Milk Protein Isolate, Almonds, Palm Fruit Oil, Chocolate, Xylitol, Cocoa Butter, Natural Flavors, Cocoa Powder (Dutch Alkalized), Sunflower Lecithin, Sea Salt. Prebiotic Dietary Vegetable Fiber, Whey Protein Isolate, Milk Protein Isolate, Almonds, Chocolate, Xylitol, Cocoa Butter, Cocoa Powder (Dutch Alkalized), Natural Flavors, Palm Fruit Oil, Sunflower Lecithin, Sea Salt. Prebiotic Dietary Vegetable Fiber, Peanut, Milk Protein Isolate, Whey Protein Isolate, Chocolate Cookie (Calcium Caseinate, Chicory Root Fiber, Palm Oil, Sugar, Alkalized Cocoa Powder, Ground Flax Seed, Sunflower Lecithin And Natural Flavor), Organic Chocolate Coating (Unsweetened Chocolate, Cane Sugar, Cocoa Butter), Peanut Flour, Glycerin, Natural Flavors, Xylitol, Chocolate Chunks (Unsweetened Chocolate, Cocoa Butter, Soy Lecithin [emulsifier], Vanilla), Sunflower Lecithin, Sea Salt, Almond, Cashew, Sunflower Butter, Stevia. Prebiotic Dietary Vegetable Fiber, Whey Protein Isolate, Milk Protein Isolate, Cashews, Whey Protein Concentrate, Xylitol, Palm Fruit Oil, Safflower Oil, Non Fat Dry Milk, Natural Flavors, Cinnamon, Sunflower Lecithin, Sea Salt, Yogurt Cultures. Prebiotic Dietary Vegetable Fiber, Milk Protein Isolate, Whey Protein Isolate, Vanilla Cookie (Calcium Caseinate, Chicory Root Fiber, Palm Oil, Sugar, Whole Milk Powder, Ground Flax Seed, Sunflower Lecithin, Natural Flavors), Almond, Yogurt (Sucrose, Fractionated Palm Kernel Oil, Whey Powder, Nonfat Dry Milk Powder, Yogurt Powder [Cultured Whey and Nonfat Milk], Soy Lecithin [emulsifier], Vanilla), Glycerin, Cashew, Cocoa Powder, Palm Oil, Chocolate Cookie (Calcium Caseinate, Chicory Root Fiber, Palm Oil, Sugar, Alkalized Cocoa Powder, Ground Flax Seed, Sunflower Lecithin and Natural Flavor), Natural Flavors, Cocoa Extract, Cane Juice Sugar, Xylitol, Sunflower Lecithin, Stevia, Sea Salt. Prebiotic Dietary Vegetable Fiber, Vanilla Cookie (Calcium Caseinate, Chicory Root Fiber, Palm Oil, Sugar, Whole Milk Powder, Ground Flax Seed, Sunflower Lecithin, Natural Flavors), Milk Protein Isolate, Whey Protein Isolate, Cashew, Glycerin, Natural Flavor, Yogurt (Sucrose, Fractionated Palm Kernel Oil, Whey Powder, Nonfat Dry Milk Powder, Yogurt Powder [Cultured Whey and Nonfat Milk], Soy Lecithin [emulsifier], Vanilla), Xylitol, Palm Oil, Nonfat Dry Milk Powder, Tapioca Fiber, Sunflower Lecithin, Peanut, Almond, Sunflower Butter, Sea Salt, Stevia. Prebiotic Dietary Vegetable Fiber, Peanuts, Whey Protein Isolate, Milk Protein Isolate, Cocoa Butter, Natural Flavors, Palm Fruit Oil, Xylitol, Strawberry Juice Concentrate, Sea Salt, Sunflower Lecithin, Beet Juice Powder, Citric Acid. Prebiotic Dietary Vegetable Fiber*, Peanuts, Whey Protein Isolate, Milk Protein Isolate, Cocoa Butter, Natural Flavors, Palm Fruit Oil, Xylitol, Strawberry Juice Concentrate, Sea Salt, Sunflower Lecithin, Beet Juice Powder, Citric Acid. Prebiotic Dietary Vegetable Fiber, Whey Protein Isolate, Milk Protein Isolate, Almonds, White Chocolate (Cane Sugar, Cocoa Butter, Whole Milk Powder, Soy Lecithin (non-GMO), Vanilla Extract, Ground Vanilla), Xylitol, Cocoa Powder (Dutch Alkalized), Beet Juice Powder (for color), Natural Flavors, Sea Salt, Cashews, Peanuts. Prebiotic Dietary Vegetable Fiber, Whey Protein Isolate, Milk Protein Isolate, Palm Fruit Oil, Almonds, Xylitol, Whey Protein Concentrate, Nonfat Dry Milk, Natural Flavors, Sunflower Lecithin, Sea Salt, Yogurt Cultures. 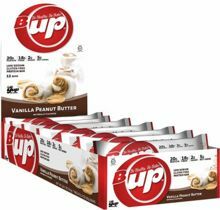 Prebiotic Dietary Vegetable Fiber, Whey Protein Isolate, Milk Protein Isolate, Peanuts, Palm Fruit Oil, Xylitol, Cocoa Butter, Natural Flavors, Almonds, Whey Protein Concentrate, Nonfat Dry Milk, Sea Salt, Sunflower Lecithin, Yogurt Cultures. 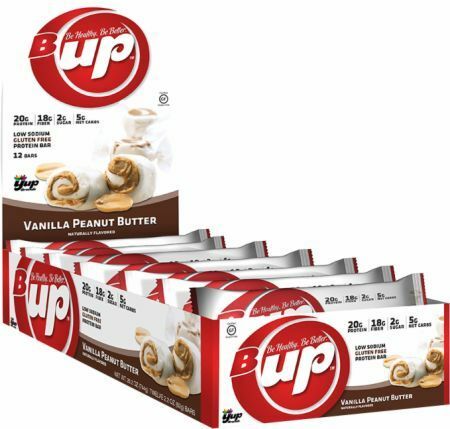 B-Up the high protein bar your body needs and taste buds want.